This composite image shows the galaxy cluster 1E 0657-56, also known as the "bullet cluster", formed after the collision of two large clusters of galaxies. Hot gas detected by Chandra is seen as two pink clumps in the image and contains most of the "normal" matter in the two clusters. An optical image from Magellan and the Hubble Space Telescope shows galaxies in orange and white. The blue clumps show where most of the mass in the clusters is found, using a technique known as gravitational lensing. 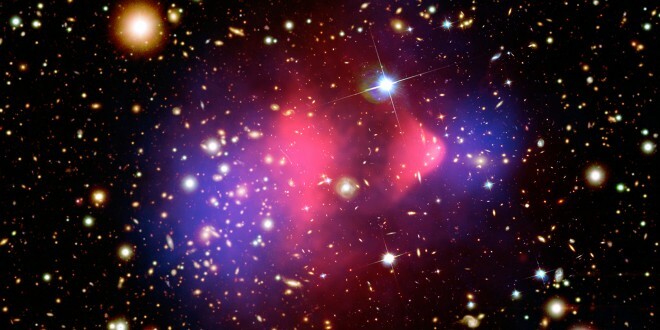 Most of the matter in the clusters (blue) is clearly separate from the normal matter (pink), giving direct evidence that nearly all of the matter in the clusters is dark. This result cannot be explained by modifying the laws of gravity. Miguel Nuevo, George Cooper and Scott Sandford are the first NASA researchers at the Ames Astrophysics and Astrochemistry Laboratory in Mountain View that provided experimental evidence showing that DNA sugar can be formed in space. In December 18, 2018, they published their study in the magazine “Communications of Nature”; in this article they explain their experiment, and how it proves that DNA sugar can be formed in space. The researchers combined some elements present in space, such as water and light, in a vacuum chamber that simulates the environment in space. The researchers found that many varieties of sugar derivatives were created. The Ames team cooled an aluminum substance to near absolute zero to match the environment in space. They then added a mixture of water vapor and methanol gas, exposing it to ultraviolet light and heat to imitate the environment in space. This experiment was designed to help answer the question of whether the life can form in a spatial environment by itself, not just creating “elementary building blocks.” A popular theory is that essential components for life can be found in meteorites, allowing them to move around the space. If this theory is correct then it means that life may be formed on planets after the crash of some meteorites into the planets, or the combination of many meteorites. This experiment and many others tell us that the chemical components of life can be found around the universe, which means that perhaps we are not alone. The astrophysicist Carl Sagan said: “The nitrogen in our DNA, the calcium in our teeth, the iron in our blood, the carbon in our apple tarts were made in the interiors of collapsed stars. We are made of star material.” What scientist are trying to understand is how do these materials form life. We know the chemical components that form life, but we do not know how to put those materials in order; we don’t know how to use these materials to form life.